We did not think we would produce another issue of our newsletter until the summer but feel compelled to do so due to the one resounding message emerging from the recent series of sales announcements: the negative impact of the continuing slide of the dollar and yen. Most leading Europe-based luxury goods groups have reported Q1 sales growth well into double digits (Richemont and Burberry reported full-or half-year results due to different calendar years) . We think the outlook continues to be very positive, thanks to the “virtuous triple play” of a positive overall economic environment, the emergence of new markets and the ever increasing population of high net worth individuals. However, as evidenced in the table below, an average of 5 points of growth has been eaten away by the effect of currency, namely the downward drift of the dollar and of the yen versus the euro. With an average sales growth at constant currencies of some 14% for the companies under review, this represents a loss of more than a third of their growth! 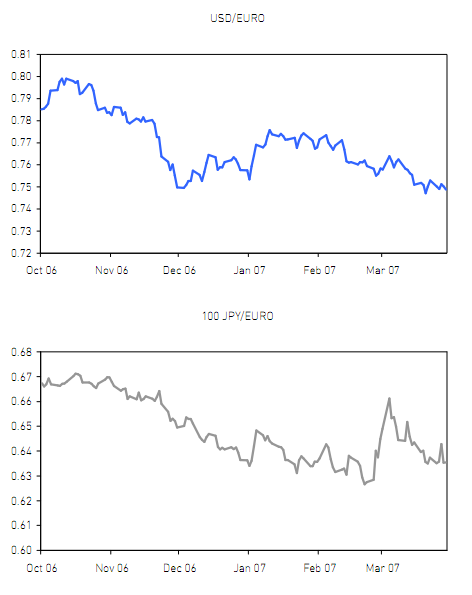 The graphs overleaf plot the slide of the dollar and of the yen against the euro over the last 6 months. While the yen seems to have stabilised in the first quarter of 2007, the dollar continues to be on a worrying downward trend. This situation is reminiscent of 2003, when the sustained devaluation of the dollar and the yen since 2002 resulted in annual sales impacts into the double digits, notably 10% for LVMH and 13% for Luxottica. The major luxury goods groups have disclosed little on their currency hedging strategy but equity analysts will undoubtedly press management for details as they review their forecasts for the forthcoming year. Finally, for those who have become fans of the Savigny Luxury Index, please note the SLI is up 14.8% over the period 1st January to 14th May. This compares to an increase of 4.7% in the FTSE All World Index over the same period.